In yet another strange twist, MGM Resorts International, the parent company of Mandalay Bay, is accusing Las Vegas investigators of pushing fake news about the deadliest shooting in modern U.S. history. 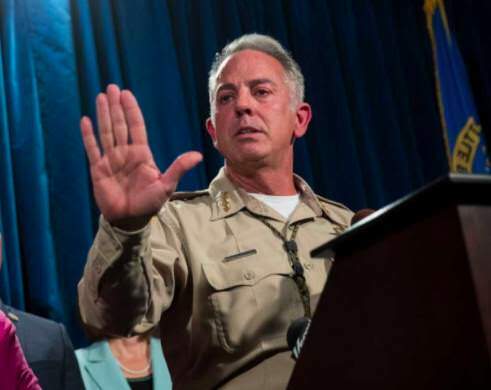 In a statement released late Tuesday, MGM Resorts International disputed Sheriff Joe Lombardo’s revised timeline of the Oct. 1 mass shooting on the Strip. Lombardo revised the timeline during a news conference Monday. He said police had learned that security guard Jesus Campos was shot in the hallway before at least 58 people at the Route 91 Harvest festival were killed and nearly 500 were injured. Police previously said Campos was shot after the attack on the concert crowd. The investigation into the events and the motive behind the Las Vegas shooting last Sunday night is in flux. To date no motive is provided by the FBI and local police. Last week a press conference was held jointly by the FBI and the local Sheriff in Las Vegas concerning the recent murder of at least 59 people in that city. The Sheriff appeared transparent in the information he supplied. But the major question that everyone wanted to know was – why did the killer do it? What was his motive? Monday we found out that the killer shot the security guard before he fired on the crowd of people. This directly contradicts with the earlier report that the security guard found the room of the killer and stopped him from shooting on the crowd. As a result many more questions are raised like – Why the change in story? Why did the killer ever stop shooting on the crowd if the security guard did not stop him? The FBI’s lack of transparency along with the corrupt and criminal acts by former FBI Directors lead all of America to begin forming conspiracy theories and to further lose trust in the FBI.